Boeing keeps churning out the 787s! 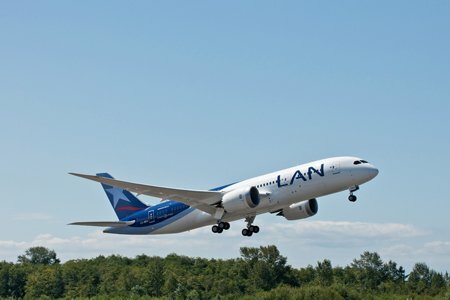 LAN Airlines, received delivery of the first 787 Dreamliner yesterday. The new plane arrived in Santiago, Chile September 1st, making it the first airline in the Americas to receive the new airplane. LAN is one of my favourite airlines. I have always found them a delight to travel with. LAN has ordered 32 planes that will be phased in over the next 10 years at a cost of almost five billion dollars. The destinations the 787 will fly to during its first year of operation will be Santiago, Buenos Aires, Lima, Los Angeles, Madrid and Frankfurt. I would love to have seen it ply Santiago to Sydney, Australia. The LAN version of the plane has a two cabin layout: Premium Business and Economy with capacity for 247 passengers. This compares to the 270 seats on Ethiopian, United’s 219 seat version. In contrast, there are only 186 seats on JAL and a mere 158 on ANA.I wonder if those carriers will start to add more seats?! In Premium Business LAN has a five rows of seats 2-2-2 layout giving a total of 30 Premium Business seats. LAN surveyed its regular premium business-class passengers and found that its passengers strongly preferred side-by-side seating to alternative staggered seating configurations. Pitch is 75″ and width 23″. In economy class LAN has arranged the 217 seats in a 3-3-3 configuration giving a 16.8” wide seat and a pitch of 31”. Every seat has seat back TV. More photos are on my Pinterest. I still need to engineer a way to fly on one soon. I can’t wait to fly this baby! In your previous article you mentioned United’s 787 has 219 seats. 219 vs 291, which is correct? Thanks. Definitely 219. Phew….291 would be a trite squeezy! I’ll be flying it October 1. After all the issues with other airlines, I do this with trepidation.